I connected to everything about it right off the bat, didn’t experience any issues “getting into” the book and not once did my attention wane. True… I didn’t stay up all night to finish it, but that’s ’cause my cold-medicine kicked in and knocked me out before I could. But I didn’t want to finish it that fast anyway, and what better way to start my day then to continue reading a book I’m already so into? I loved these people, and I absolutely loved the pacing. Gradual and tentative, but constantly progressing and always had me brimming with anticipation. Everything made sense. It was EXACTLY as I think it would play out in real life. And just look at how many loved it as much as I did! 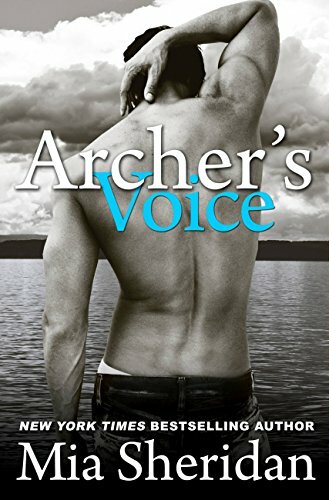 Maryse’s Book Blog: I couldn’t resist and just started “Archer’s Voice” and OMG I’m already feeling it. Great writing and I’m getting the impression he’s very… hermit-y. Why oh why do I love a tortured hero-hermit? LOL!!! Great reading awaits me, I can tell. Paula: This book is fabulous! I finished it earlier this evening. 5 stars! It just gives you that “feeling” that your are reading something great! Loved it. Book: Oh you’re in for a great read..
Rebecca: AMAZING book! Read it in one sitting….and did not sleep a wink but Archer Hale was worth it. It blew me away. Janet: I just finished it about 30 minutes ago. It was beautiful!!! Tatiana: Read it yesterday and it was so good! Ashley: It’s was an amazing read! Bridget: Another great one Maryse! Enjoy! Tiffany: Ok I’m going to have to get this book! I keep hearing good things about it! Michelle: 20% in and I love it. Heroine is sweet and strong (a combo you don’t see too often) and I live Archer! Andrea: Another amazing book by Mia Sheridan! Maryse you have to read Leo and Leo’s Chance. Heather: Reading it now and loving it!!! Sara: It’s SO good. Like, TSOT good. Bobbi: I loved it!! I love Archer. Sarah: It is a phenomenal book!!!! Love Archer!!! Jill: Finished it this morning. I love this series. Maryse, you will love Leo. My favorite of them all. Sticks with you. All of these books are standalone Shanda and no cross over characters. Wendy: Just finished it – great book! Maryse’s Book Blog: Yep… I’m falling in love with Archer. Kristy: Just finished it, gave me a book hangover, lol! Renate: Mia Sheridan writes awesome male characters….you just have this need to care for them! It was an awesome book…Archer….(sigh). Jody: I’m reading it now and LOVING it!!! Melissa: I am completely in love with Archer!!!!! Definite swoon factor…he feels everything with such honesty….be still my heart! Maryse: Loving it!!! Perfectly paced, perfectly detailed… He may not be a bad boy but I am in love! Awwwwww! The folded chips… No pretenses, no games, no overly melodramatic self-punishment… Just life as it happens with the drama of it occurring naturally. I LOVE it. Renate: the folded chips…..so so sweet!!!! No insta-love, no innuendoes, no flirtatious yet haughty, sarcastic banter (although if done right, I can enjoy those things, too). This was about two “damaged” people (<— I cringe using that word, as it’s sort of become a “usual” – maybe even a cliché in our genre), but this story had an incredible richness to it. The author did not fast-track us through the story and interactions just to get to the “good part”. There was no rushing, because each step of the way was integral to our bond with the characters (and their bond to each other). Important for what we, and they, were about to experience. Bree is on the run from a trauma, and travels to another state (one that gave her comfort as a child when her family would vacation there). Renting a cottage on the lake, and getting a simple waitressing job at the local “country” restaurant, she’s also getting her bearings back, and trying to find her way again. Maybe even one day, rid herself of her PTSD that haunts her every day. Maybe going out with people who weren’t so acquainted with my tragedy would be better-after all, wasn’t that what this road trip was all about? A temporary escape? The hope that a new place would bring new healing? And then I would have the strength to face my life again. I laughed a small embarrassed sound, but then grimaced slightly. “You know, it would really help me out if you would speak and put me out of my misery here.” I grinned at him, but immediately went serious as his face fell, his eyes shuttering and a blank look replacing the warmer one I had sworn was there moments before. “Hey, wait!” I called starting to step after him. I stopped myself though, frowning as he moved away from me, his body moving with grace as he started to jog slowly toward the street. The strangest feeling of loss washed over me as he crossed and walked out of sight. … she won’t leave him alone. ‘Cause every once in awhile she notices a slight lip tilt. A possibly amused “smirk” if you will. The town people all have a roundabout gossip story about his past, who he is, and what his problems are (he doesn’t speak to anyone, so many suspects various impairments), but the consensus is… don’t bother trying. My eyes darted up to his and my mouth opened slightly to respond, but I snapped it shut before answering his question. Kind of rude question, by the way. “Do you want to get a pizza or something?” I blurted out, my eyes widening. I hadn’t exactly decided to go there, I just had. I looked at him hopefully. He stared back like I was an advanced math problem he couldn’t interpret. Ahhhhhh you guys are in for so an AMAZING treat, ’cause the rest is so much fun to read from there on out. Actually it was perfect from the very start. There are so many highlights in my book, I just couldn’t stop myself, because it was all meaningful. It was all my favorite. I guessed this was an apology? Or… a gesture of friendship? What exactly did it mean? I groaned. This man! I laughed out loud, hugging the candy bars to me and then standing there grinning like a fool some more. Awkward boy. Sweet, silent Archer Hale. We communicated a thousand words, without a single one being spoken. and the steam. Ohhhhhh the steam. And so much better when it finally comes through in a story like this. Very tangible, very real, and not gratuitous. They may be of “new adult” age, but it had a mature feel to it (incredible writing! ), was stunningly profound, charming, funny, and had my heart soaring. And at times, crying. It almost had a “Defying the Odds” <— misunderstood loner in a small town (with the whole “small town” family feel) crossed with a The Sea Of Tranquility feel (Sara, thank you for that comparison… I get where you’re coming from with that!). But! This story stood out on it’s own, had it’s own incredible backdrop and cast of characters that lived and breathed as if they truly existed. And like Sherri said above, I can’t help myself when it comes to a handsome, yet brooding “loner” hermit of a male. The kind of person that appears so indifferent, shunning what others expect of him, but yet has a story so heartbreaking that lead him to live that kind of life. And that one person that he lets in… even for just a moment. Oh how I love living that moment. And maybe getting to live an entire book of that? Sign me up! You get it, with this one. The obvious disinterest, lack of communication, personal space issues and mistrust, to an eventual (yet cautious) friendship. An eventual bond, a deep connection and potentially so much more. But there’s always that one step forward, two steps back issue, and I’m a delighted sucker for it, when it plays out like this one did! But like I mentioned above in our reader-chat, this book isn’t loaded in a kind of angst that feels forced simply to drive the drama. Okay yes, the “drama” is somewhat inconceivable in terms of how crazy the circumstances were, but crazy like this has happened before (in real life). But what mattered most, to me? I believed the story as it was told. Because of the way it was told. No manipulation or pretenses… just life. Past, present and plausible future playing out in a very natural feel. New experiences unfolding, secrets being revealed and the sweet, sad, scared, angry, raw and innate reactions that are the result of those realizations. This book had me grinning from ear to ear, sighing in sweet satisfaction, and wanting to cuddle my iPad just to “osmosis” my love to them. <— tee hee 😉 I know. I didn’t say that right. But you get me, right? From silly sweetness to intense hurt and jealousy to sorrow and heartache (and not necessarily in that order), this story has it all. And this author does it right! It just came out Tuesday and already has 66 five-star reviews? Then go ahead and throw mine in the mix!! P.S. @Jill: Leo is your favorite in this series? Even after this one!?? Oh my… I don’t know if my heart could take an “awesomer” 😉 character than Archer, but you know me… I’m game for more intense love! And I’m a Leo too, so this should be fun! P.P.S. Here is the “Sign of Love” Series Reading Order – although I hear they can be read as standalones (no character crossovers). I havent read the others in this series, can this one be read as a standalone? If so, it’s next on my TBR. I’m reading Real now, somehow I missed it last year…thanks for the awesome recommendation! Amazing book! Absolutely loved it! Loved this one soooo much but Leo just has a little permanent section of my heart. You’ll understand when you read it. Sigh. I read “Stinger” and now this one, and neither have anything to do with the other. I’ll have to read this next. Loved the Leo books! YES… this day (miserable weather for Florida) you feel me, Maryse… has been made feel warm and fuzzy cause I am spending it with Archer! This is my favorite book by this author so far, they just keep getting better. Maryse, I agree with your review. There were parts where I too wanted, needed to hug them. BTW Leo was truly special, not better per say…but like I said…the male characters Mia Sheridan writes about inspire us to feel for them and root for them as well. Stinger was a great read too But Archer and Leo were special! Lise, yes this grayish cold and rainy day was made so much brighter by this book. Kept me warm and cozy and gave me that love-fog back again! Renate… I can’t wait to read Leo! I have no idea why I waited so long… I mean, especially since I read Stinger and Archer almost immediately upon release. *sigh* Silly me! Omg, Maryse, you’ve got me one-clicking again! OMG! I loved this book. Fantastic review. Since Leo, Mia Sheridan has been that author for me that I don’t even need to read the blurb to know I will buy the book. She writes it, I’ll read it. I absolutely LOVED Leo and really like Stinger so for sure this one is next. Can’t wait! Ok I have a question… I’m in the middle of a trilogy right now and just read this review…. I happen to have the first 3 books and ready to start the series next…but after that review…I want to read this one first. It says it’s can be a standalone and I really need a 5 star right now. So can I read this one first and then the others or will it be confusing. Yep read this one first!!! 🙂 That’s fine! 80 reviews on Amazon & 79 are 5 Stars!!!! I’m starting right now! I know, Josie…. it had me hooked!! Lynne, get going on it! I just got my friend Sherry on it pronto. I agree maryse, my favourite book of 2014. I stayed up all night to read it, It is one of those books that you want to cuddle your ipad! Osmosis and all! I just one clicked too!!! I have 10 books in my iPad waiting for me but this review just made me change my plans!!! I finished 2days ago “Making Faces” and loved so much!! I need a really good book to follow up that one…. This might be it! Just finished Archer last nite. Read it all day in between bits and pieces of my life. I am in love with Archer. He is definitely going on my list of book boyfriends, so different, but vulnerable. I think I liked Archer better than Leo. Stinger was a little different type of book to me, but loved it too. Nooooo I’m reading it just now I’m at 46% and I just know what stupid Travis is up to I can’t read it no no no!!! Really loved this book!! Archer is such a beautiful man. Thanks Maryse! Just finished this book last night and came back here to read your review. You are right as usual. Great book, great characters, great story! Totally reminded me of Sea of Tranquility in the beginning, but Archer…..there is no one else like him! I found myself crying or filling up at some of the sweetest, simplest scenes…..I just loved it!! Just finished. I agree this book is a best read of the year. I liked it much better than Leo. And I liked Leo, but Archer was just….. sweet and heart breaking. A must read. I’m a little late to this party, but I have to tell you I’m about 70% in and am absolutely LOVING it!!! Your review is spot on. A definite 5 star read for me too!! Thanks for the review Maryse 🙂 You always bring great books to our attention! OK.. I am wondering why I stayed up until 3:00am reading and up at 7:00am for work and now I am sitting here with a slamming headache, why did I stay up…..OH YEAH ARCHER….THATS WHY…OMG… I am 60% and I am dying, loving it, cant wait to run home at lunch and get in a chapter and then back to work….this is becoming a serious problem, no sleep, no housework getting done, need to food shop….but wait one more chapter and then I will……. OMG since I was turned onto Maryse Blog and followed her reviews my life has changed…..how is everyone getting normal life stuff done around here with books like this waiting to be read.? Haha Patty! I do the same thing…stay up late, get up early….rush home for lunch to read a couple pages….not getting normal life stuff done either, but it will wait!! Haha! Loved this book so much! Enjoy it! I just finished reading Archer’s Voice. I could just cry, that’s how Beautiful this story was. man whenever I eat a folded chip. DONE…OMG….AHHHHH Anything I pick up now will pale in comparison. My husband has 4 deaf aunts and he used to sign a lot years ago, I think he needs to start doing it again….Awesome review, dead on with the 5 stars..I guess I will read the rest of the series now. I just finished…WOW! I agree anything I start after that amazing book will be disappointing! I might have to read it again. Great recommendation Maryse! I loved this book. A must read! This book was incredible!! What do we read next?!! I will always think of Archer when I see a “folded” potato chip…..so glad to see everyone enjoying this one! Just finished this at 2am this morning and I just have to say “wow”… this is definitely a book that will stay with me awhile. I read “Leo” and liked her writing style from that one but there’s just something more unique about this story. I really liked how the story progressed without having the same stuff rehashed over and over plus it was a relationship that developed over time so you really felt each up/down with them. Archer’s Voice is a beautiful story. The H/h are both strong yet fragile characters and I enjoyed how their friendship and love helped them find their own sense of self as well as each other. And Maryse, you MUST read Leo. I just read it last week and I don’t have any earthly clue why I waited so long when it’s been on my kindle for months. It is just as wonderful as Archers Voice. Mia Sheridan is awesome! One of the best books I have ever read. Loved it. Well you have never steered me wrong and you sure didn’t with Archer’s Voice. Just finished it and am basking in how real a story this seems. I loved how it slowly unfolded and grew to the point of OMG did he just say that? Thanks again for all of the recommendations, i don’t take all of them but this one was right on. I don’t often stray from the paranormal type novels, but this made my week, my month, my year. will have to read the others as well. And maybe stray more often. does anyone know of any books similar to archer’s voice other than maybe someday & poughkeepsie? Thanks! What do you recommend to read after this book? It was so amazing- I’m having a hard time finding a new book that will even come close!